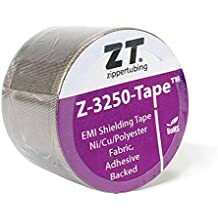 Z Shield 2l - Shielding Tapes And Wraps - Emi Shielding - Products - ZT | Zippertubing Co.
0.5" 0.75" 1.0" 1.125" 1.25" 1.375" 1.5" 1.625" 1.75" 2.0" 2.5" 3.0" 3.5" 4.0"
Z-Shield® (2L) consists of two layers of fire-retardant Polyurethane film encapsulating a Z-3250-CN EMI shield cloth, and utilizes a double adhesive closure. The dual layer of Polyurethane film creates a finished jacket that has an inner dielectric spacer and will meet UL224, VW-1 flammability requirements. 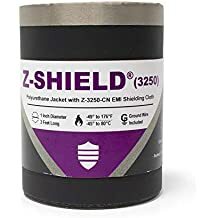 Z-Shield® (2L) provides outstanding electromagnetic shielding of wires and cable bundles. It is highly flexible, and provides good dielectric strength and mechanical protection of the cable. The product can be configured for Round; Flat or Rectangular cable shapes and is available with or without a drain wire. This product has an operational temperature range of -45° to 80°C (-49° to 176°F). Cable Diameter 0.5" 0.75" 1.0" 1.125" 1.25" 1.375" 1.5" 1.625" 1.75" 2.0" 2.5" 3.0" 3.5" 4.0"
PFR-8235 is a versatile light weight material that has good abrasion resistance and is an extremely flexible, flame retardant polyurethane material that has a soft rubber-like texture. The PFR-8235 is made of 7 mil PFR-18 material backed with adhesive that allows easy lamination of cloth, foil and mesh materials such as our SH1 and Foil Shielding. The PFR-8235 has an operating temperature range of -53 to +80°C. The material is a good choice for many nuclear, aerospace and military applications where PVC materials are not permitted. PFR-8235 can be cut to any desired widths up to 36". The PFR-8235 is used primarily to produce our ZT-Tape, Shielded-ZT-Tape and the Z-Shield family of products.